This article originally appeared on the Kiltwalk website. What do you think is the best song to get you hyped up and motivated for a Kiltwalk day? For me it’s got to be the opening track from the Greatest Showman soundtrack – The Greatest Show. It also picked us up a few times during the walk – you can’t beat a good singalong when you’ve run out of chat! It’s a combination of factors that keep you going. The support you get along the way from the charities and local supporters is amazing. You feel really proud of yourself when you’re passing through pit stops and people are cheering you on. What made the difference for you during the walk? A particular snack, pit stop, word of wisdom from a fellow walker, thought, etc. It’s a combination of factors that keep you going. The team spirit from colleagues helps pass the time as the Mighty Stride can be a long day! But the support you get along the way from the charities and local supporters is amazing. You feel really proud of yourself when you’re passing through pit stops and people are cheering you on. We also got a little bit addicted to a Cadbury Dairy Milk mint Oreo bar. Surely the calories don’t count if you eat while you’re walking!? How did your team, the Chartered Akiltants, support you and keep your spirits high? The team were a fantastic support. There were a lot of laughs along the way and, what’s great about having a big team walking, is that you can always find someone that matches your pace. It also worked out that we all had our ‘wobbles’ at different times – when you don’t think you are going to make it to the end – so everyone takes on the role of ‘team motivator’ at one point during the walk. You also find yourself supporting people you’ve never met before as you are all in the same boat! What is the one thing you couldn’t take on the Kiltwalk without? It’s all about the socks! The team were sick of hearing about my socks, but I completed all four Kiltwalks wearing the very same pair of socks, with no blisters at all. Very proud of that. Thorlo Experia socks are the way to go! Describe that finish line feeling! I always find it quite emotional. The atmosphere is electric and everyone is so supportive. You worry that if you stop walking you might never get started again as the aches and pains start to creep in very quickly. We always have an amazing team of JC supporters there ready with a glass of fizz to celebrate with. Although they topped that in Edinburgh last year and greeted Michelle, Jillian and I, who had completed all four walks, with a trophy and a tiara. We were delighted! So there you have it - everything you need to know to complete your own Kiltwalk challenge. There are three distances to choose from; The Wee Wander, The Big Stroll, and The Mighty Stride - find out more and sign up on the Kiltwalk website. We look forward to seeing you there! 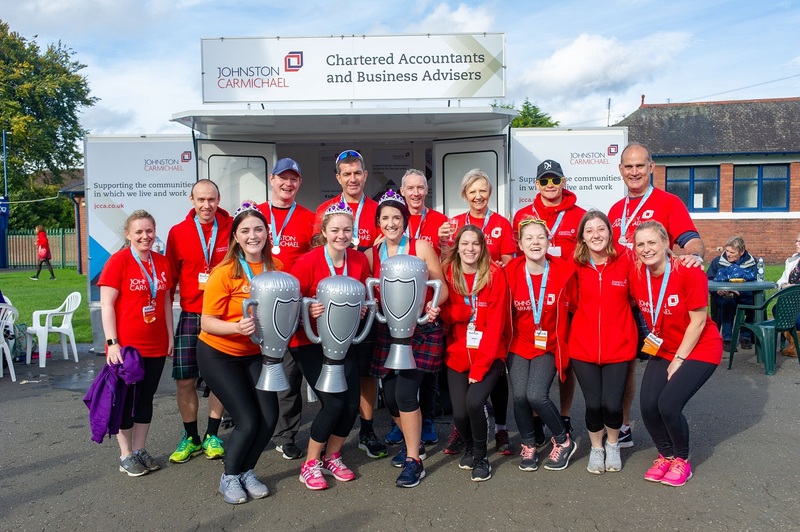 2018 was the biggest and best year yet for The Kiltwalk with over 20,000 walkers taking part. This year’s total is still to be finalised but at last count it was an incredible £4,890,865 for 1,156 charities across Scotland!